A note about the weather, before launching into what it was like flying kites in the 1950s... Winter is still very much with us in the UK. 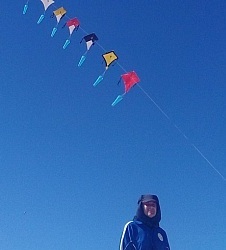 Two weeks ago much of the country was blanketed with snow, including the North East, where I do most of my kite flying. For a few days conditions improved then we were plunged into more extreme weather conditions and the wind chill would have made flying uncomfortable and even dangerous. Today it is bright with blue sky but the temperature is just above the freezing point and I have decided to abandon any idea of being outside. If I walk due east from my home I reach the North Sea or, more accurately, the promenade at the coastal resort of Whitley Bay. If I walk straight ahead I can fly over the beach. and if I turn South I can enjoy “coffee” in a pleasant café. Whitley Bay developed as a holiday resort in Victorian times and is now a town ideal for commuting to the main employment centres on Tyneside. During the 1950’s the Town played host to many people from Scotland, particularly Clydeside, who chose Whitley Bay as their holiday destination. On a fine day the beach would be crowded with both holiday makers and day trippers and many children could be seen flying kites. In those “ancient times” very few kites were commercial items. Most were home-made. A few splendid box kites might be seen. These were the “Gibson Girl Box Kite”. They were RAF surplus stock and had been intended to fly radio aerials above rescue dinghies launched from “ditched” aircraft. These kites were very technical and beautifully manufactured compared with the typical home-made product. 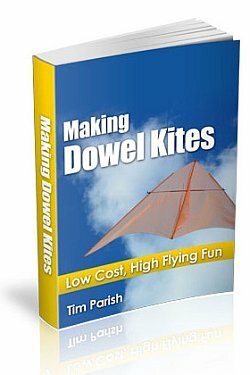 In the days before the internet the techniques of kite flying and kite building could not be found by people wanting to enter the hobby by the simple click of a computer “mouse” leading to a website such as this. We relied on knowledge passed on by our fathers and elder siblings. Kite Festivals were something for the future although youth groups such as the Cub and Scout Movements held kite making competitions and “fly-ins”. Materials for kite making were in short supply. Indeed, for kites in the 1950s during the “Age of Austerity”, nearly everything was in short supply in the UK including essentials! The traditional kite of this time was the “diamond kite” and the available materials almost guaranteed that it would be both heavy and fragile. The frame was often 6mm soft strip-wood with string securing the crossed arms. Usually the ends of the frame were notched to take a string “loop” around the perimeter. Some flyers managed to use bamboo from plant supporting garden canes which was flexible, particularly when “split” and offered greater crash resistance and lighter weight. The sail was often paper, or less frequently somewhat heavy cotton. We did not use good quality wrapping paper which was too precious a commodity. Brown wrapping paper was carefully taken from a parcel and folded ready for re-use, sometimes more than once, and finally was used as backing paper to protect school textbooks! We used off cuts of wall paper. Most families had small quantities of this left over from home decorating. It was not ideal. It was heavy, not particularly strong and had a third disadvantage which I shall mention later. The paper was folded over the string “perimeter” and stuck down with either brown adhesive paper or with home-made “paste” adhesive. The tail of the kite was string with tubes of newspaper attached. The flying line was also cotton string. Such a kite had limited performance. It was heavy, the frame was easily broken and the sail was easily punctured, but at least we were kite flying and that was all that mattered. Perhaps the “Age of Austerity” for kite builders ended with the availability of Bri-Nylon shirts in the late 1950’s. At last we had a material suitable for the sails of our kites and the introduction of ramin dowel gave us the opportunity to build kites of increased performance. Today most people arrive at a flying site by private car. In the 1950’s young flyers might travel by bicycle but not when transporting a kite. We walked to the flying ground. I have be-moaned the foul weather and during a typical summer it was unlikely to snow but very likely to rain. Not a downpour to cause flooding but sufficient to wreck the water absorbent wall paper which soon turned “soggy” before shelter could be found. Today the weather remains fickle in the North East of England but our modern kites are light weight, they fly well, they are crash resistant and they do not disintegrate in the rain. I look forward to many warmer summer days with sufficient wind to be air-borne.